Wherever there is financial tracking, there is a need for sharing. You may share a financial worksheet with your spouse or business partner. You definitely share some type of financial information with your accountant. Perhaps you and your siblings work together on a money spreadsheet for your elderly parents. Google Sheets inherently makes collaboration very simple. Tiller takes it a step further by allowing you to create multiple sheets for different purposes so you can share only the information that’s relevant. You can safely link all your financial accounts to Tiller, but when it comes to sharing with others, you can be selective and share specific account information with specific people. 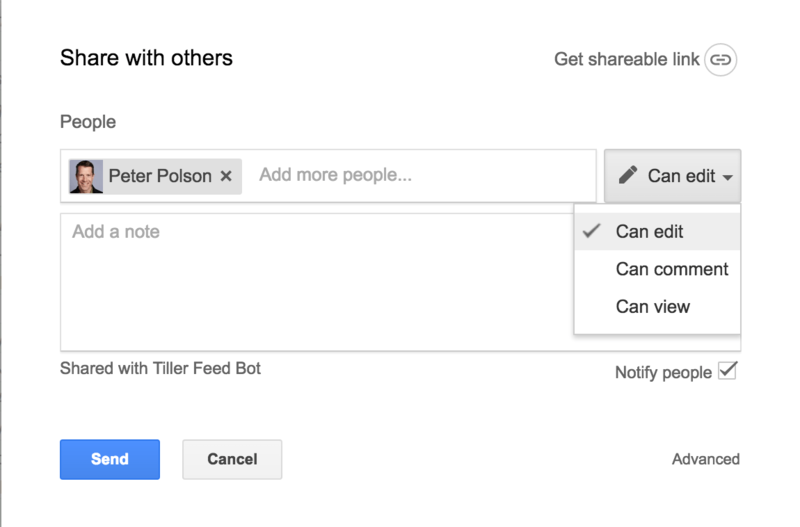 You can also narrow down the permissions that you assign when sharing your Tiller Sheet. You may want to give “view only” access to your accountant, whereas your spouse has “edit” access to your Tiller Sheet. Perhaps you’re a finance blogger and want your readers to be able to review and share your monthly net worth spreadsheet. You can get a link for view only access and anyone who has the link can view the sheet. Let’s dive into permissions with your Google Sheets. 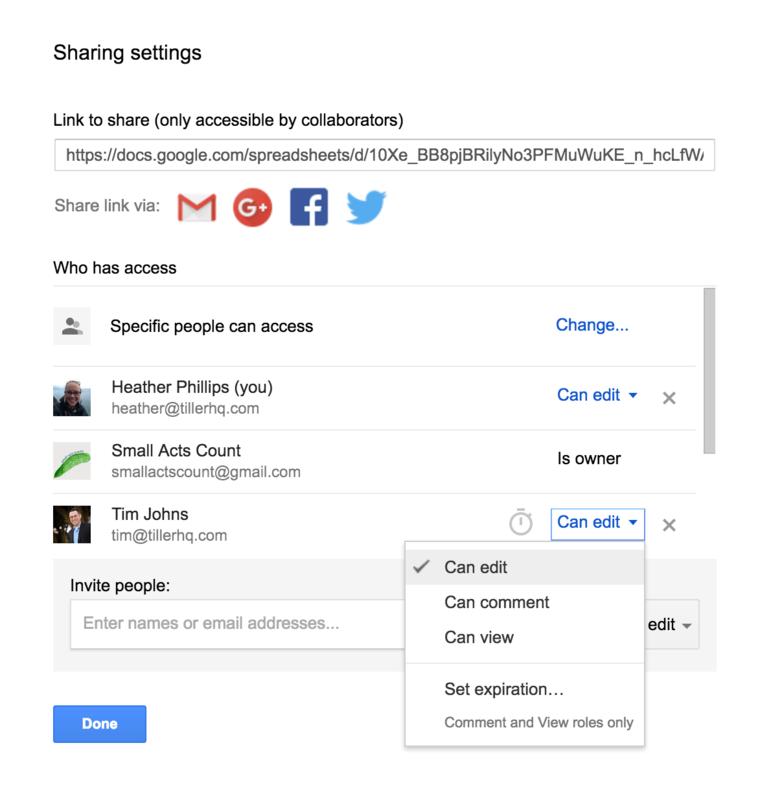 You can access the Sharing options using a couple methods in Google Sheets. Open the File menu in Google Sheets and choose the “share” option, or click the blue “Share” button in the upper right corner of your sheet. In either case the “Share with others” dialog box will appear allowing you to choose who and how to share. Type the email address for the person with whom you’d like to share the sheet and assign permissions from the drop down to the right. “Edit” permissions will allow the person to make changes to the sheet, which are always recorded in the revision history. “Can comment” permissions will allow the person to leave comments about data in the sheet, but not change any data. “Can view” will only allow the person to open and view your Tiller Sheet. You can always update these permissions later if you need to change them. When you enter the email address of the person with whom you’d like to share the sheet you’ll have the option to include a note in the sharing invitation. Click “send” to send the invitation to that person. 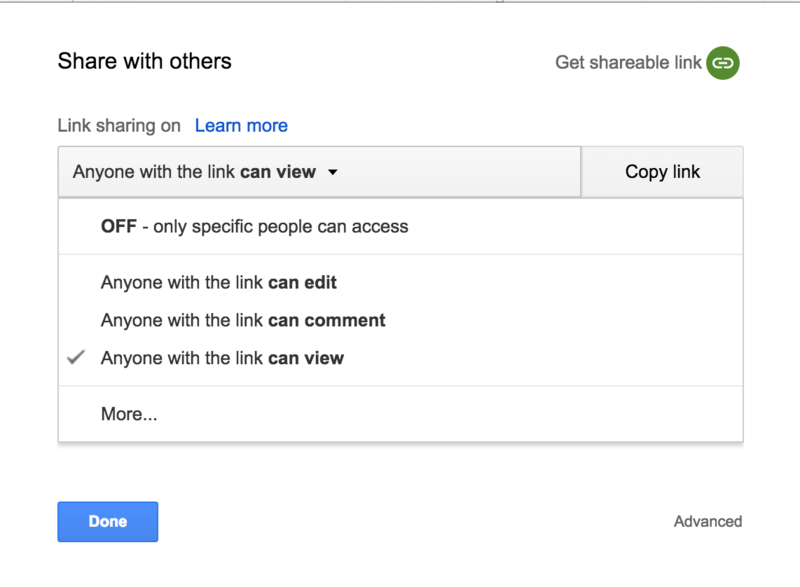 You can also open the advanced sharing settings for the sheet by clicking the “Advanced” link in the lower right corner of the “share with others” dialog box. 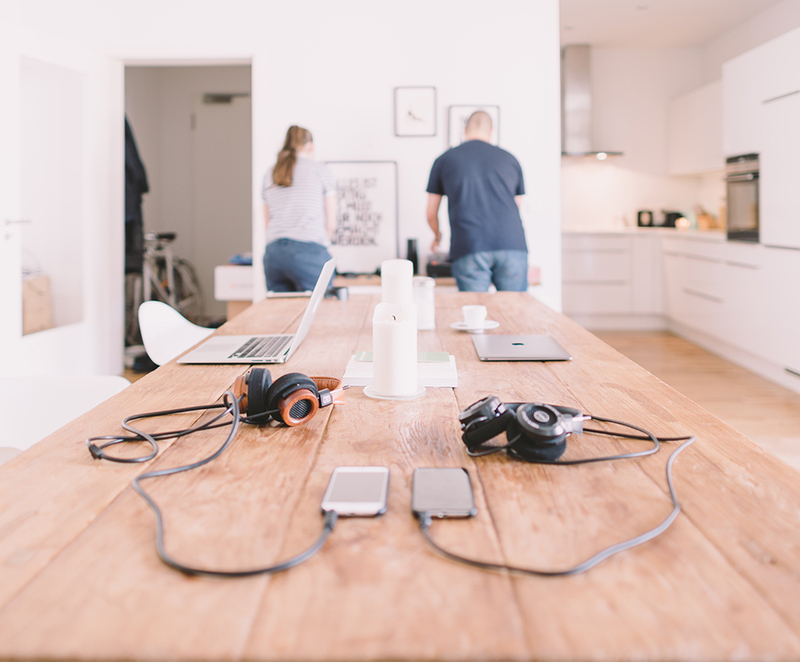 From here you can modify or remove the permissions of existing collaborators. When you’re reviewing the list of people with access, you’ll notice there’s a gray clock next to each user. If you want to automatically revoke their access after a week, a month, or a certain period of time, click the clock to configure access expiration. You can also configure this from the permissions drop down menu next to each person’s name. You can share your Tiller Sheet with people who don’t have a Gmail address or Google Account, but this option is less secure because anyone with the link included in the invitation email will have access to the sheet. Choose this option with care, and note that you can assign view only, comment, or edit permissions the same way for these people too. Sometimes you want to share your sheet with anyone. For example, you might want to post a link on your blog to a specific sheet with reports or analysis that aren’t private. There is a “Get shareable link” in the top right corner of the “Share with others” dialog you can grab and pass to anyone you want to have access. This is the least secure option because anyone who has this link can access your sheet. Again, you have control over whether these guests have view-only, comment, or edit privileges. You can feel secure sharing your sheet because Tiller allows you to create several finance worksheets, control which sheets get information from which bank accounts, and manage who, if anyone, has access to those various sheets. Remember, only you have access to your Tiller account, so no matter who has access to specific sheets, only you have access to your secure dashboard at sheets.tillerhq.com. The reasons to share are expansive, and we give you the power and the tools to make your financial management a more collaborative process. How do you envision sharing your sheet with others? Let us know on Facebook, Twitter, or the chat window on our website.